Is the client the project sponsor? This is a translation and an update from a former post written to help clarifying my position on the matter of several project managers and sponsors interacting among each other. I would say there is no reason why we would establish the identity client=project sponsor. I show below a sketch I used as speaker during the event held in April 2011 by the Master in Project Management run by the University of Valencia. 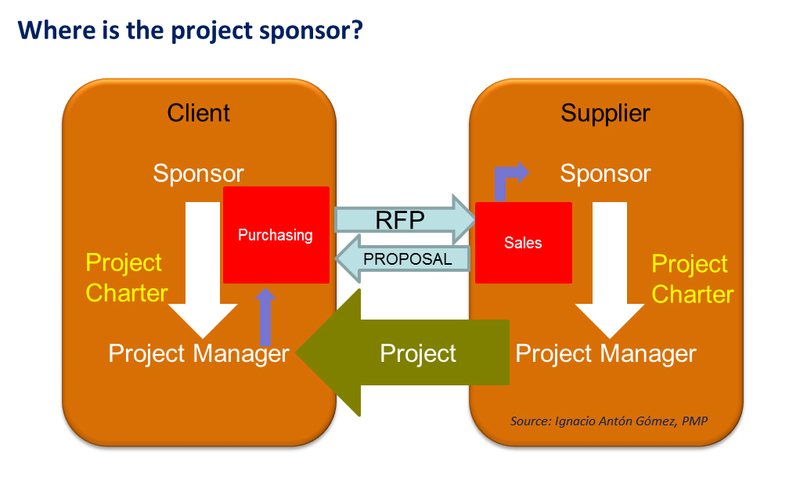 As a summary, what I think is that a client may have its own project sponsor while, simultaneously, the project supplier may have a different project sponsor too. Both roles, sponsor and project manager of each organization, might be performed by the same individual depending on project complexity. The project sponsor on the client side usually asks a project manager to plan and execute a project based on a business case and by means of the Project Charter. Both sponsor and project manager hold accountable for delivering the needed project to solve the business case. This project manager will be in charge of the planning effort. As a result, at the proper time, requests for proposals (RFP) will be issued to suppliers and vendors. This will often happen via the company Purchasing Department which will contact the Sales Department of the supplier’s organization. Once the supplier sends a proposal to the customer and gets its agreement, a sponsor on the supplier’s side should be appointed. The supplier’s sponsor should assign the project to one of the supplier’s project managers. They will write a Project Charter as part of their project initiation process. This Project Charter is different from the one written by the client since the client creates the project to solve his business case and the supplier should generate his project charter to support his own business. Of course this may become a source of conflict and confrontation. That is one of the reasons why it is important to gain alignment between client and supplier. From this moment, the supplier’s project manager starts his work to deliver the project result to his customer´s project manager. Therefore this is the model I propose to explain relative position and interactions between sponsor and project manager. These roles are often confusing and lead to think that the client can only play the role of sponsor and supplier is always the project manager. Esta entrada se publicó en Integración, Integration y está etiquetada con Integration, Sponsor en abril 11, 2013 por elprojectmanager. Dear Alexia. I am glad you read this post and enjoyed it but I decided to reduce your answer to a minimum as it was intended mainly for selling than giving back to the community. It would be great you give some insights on your book useful for other project managers rather than solely trying to get traffic to your site. I hope to see you again in the blog.